A young Julia standing beside her man, Tony DiGiovanni, in the 1940s. In her presence, it’s hard to believe Julia DiGiovanni is in her mid-eighties. Her gait is strong, her mind sharp and her wit quick. And in spite of all she has accomplished in this town, she is extremely modest. So modest in fact, she prefers talking about her departed husband, Anthony (Tony) DiGiovanni’s accomplishments, rather than her own. “Just a housewife and stay-at-home mom”. It’s a familiar phrase used by many women of Julia’s generation. And it was in that mode that this unpretentious woman did what the societal mores of the times dictated. She stood behind her man, not only wearing the hats of wife, mother and caregiver, but finding the time to handle all the financial details of the many businesses being established by her entrepreneurial spouse. Julia DiGiovanni’s life’s journey began in the shadow of tragedy. In Mojave, CA in 1918, just months before her birth, two of her older sisters died of the Spanish flu. Then, when Julia was just 10-years-old, another sister died tragically. With that death DiGiovanni became the eldest child in a family of emigrant parents, who could neither read nor write English. Thus she was designated to be, more or less, head of the family. DiGiovanni’s business knowledge had very brief beginnings in Bakersfield, CA, at Lufkins Business College, where she worked her way through school. Upon graduation she labored as a secretary for the Agricultural Extension Service in the city courthouse there. Then when World War II came along, she returned to Mojave to work for the American Red Cross - holding Field Status at the Marine Corps Air Station. In 1947 she was transferred to El Toro, CA, and it was there that she met Marine fighter pilot and future husband, Tony DiGiovanni. Three years later they were married and making their home in Laguna Beach. In 1953 the young couple was transferred to Naples, Italy. Both being of Italian descent they were thrilled to have opportunity to explore Tuscany and Sicily, the birthplaces of their parents. 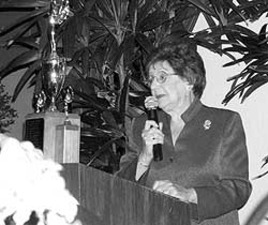 Julia DiGiovanni graciously accepting her “2003 Citizen of the Year” award. When Tony received a medical discharge in 1955, the DiGiovannis were renting a furnished home in San Clemente. They soon built a two-bedroom, one bath house on Avenida Miramar, and finally settled in their present home on Avenida Presidio in 1963. Not one to be idle, Tony opened his first business on Avenida Del Mar in 1955. Then, after establishing two more businesses, in 1975 he began founding banks; the Bank of San Clemente and Mariners Bank. All the while, standing quietly in the background behind her man handling all the businesses financial details, Julia DiGiovanni was learning the ropes. Upon Tony’s death in 1991, Julia began carrying on her husband’s legacy. She was voted onto the Board of Directors of Mariner’s Bank, and in that capacity helped set the bank’s policies. Soon Mariner’s Bank was sold to Eldorado Bank where Julia also served on the Board of Directors. Finally when Eldorado Bank was sold, DiGiovanni became a Founding Director of the Pacific Mercantile Bank. And this was just the beginning of a long list of the accomplishments of this efficacious, young-at-heart lady. Today, Julia DiGiovanni is a founding member and currently sits on the Board of Trustees for Casa Romantica Cultural Center. She served on the advisory boards for Laura’s House and the San Clemente Srs., Inc. for several years, is a member of the Board of Trustees for San Clemente Hospital and Medical Center, and a member of the San Clemente Rotary Club and the San Clemente Historical Society. She actively supports the Cabrillo Community Theatre, is a member of the George M. Cohan, Orange County Performing Arts Center, and most recently was named “Citizen of the Year” for 2003. Although living in the electronic age, Julia still records all her business details and finances by hand. Amidst all these activities DiGiovanni has still found time to travel to some very unusual places. She has been on Safari in Kenya, Africa, visited the Seychelles Islands in the Indian Ocean, seen Nova Scotia, Turkey, Greece and several places in the U.S. But she says her most awesome trip was when she went to Antarctica.